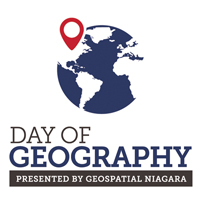 If you would like to participate in the Day of Geography, please log in through Facebook, check Google or LinkedIn to share the story of your work day. We are excited to learn about and share the multitude of careers that are related to geography and geographic education and want to communicate with those that truly want to share their stories. If you are uncomfortable with creating an account, illness we can submit a post on your behalf. For information about posting via email please visit the Submit by Email page. Rather than reinvent the wheel, the following instructions have been adapted from the “Day of Archaeology” website and are for those participants who wish to have Day of Geography set up an account for them. 1. 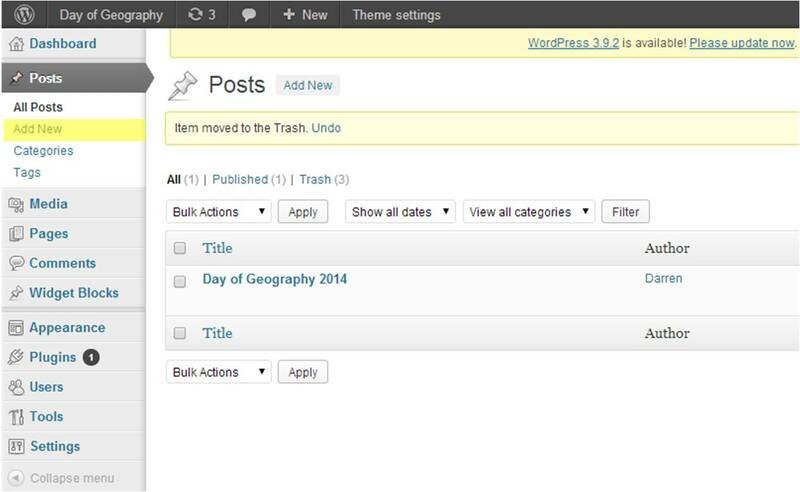 Once you have received the email from Day of Geography that includes your username and password, click on the link to go to the WordPress login screen. From there you can enter the username and password that was provided to you in the participation email. 2. After logging in you will be taken to the WordPress dashboard. 3. If at this time you wish to change your password, you can do so by clicking on the “Users” and “Your Profile” links in the left side bar. 4. Please add your name to your profile. 1. After logging in, click on “Add New” located in the left side bar (hi-lighted yellow in image above). 2. Enter the title of your post in the provided title box (hi-lighted yellow in image below). 3. 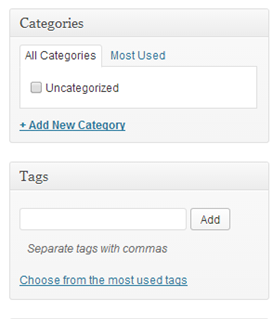 Select from, or add to the list, the Categories or Tags associated with your posting. Categories may include such things as “Physical Geography”, “Human Geography”, “Remote Sensing”, “Geoscience” as examples, while Tags may include such things as “Transportation”, “Urban Planning”, “Medical”, “Environment” as examples. (See Categories and Tags image below). 4. Enter your posting in the provided text area (hi-lighted green in image below). Once you have completed your entry click the “Save Draft” (hi-lighted in red in image below). What you write about is up to you (so long as it meets our acceptable use policy, see below). The idea is to describe your day working in geography as a geospatial professional we want to hear about your working day, the kind of tasks you undertake, what you do if you are in the field, what other organizations you work with, how important you feel your work is, why you got involved in that specific area, why you wanted to be a geographer/geospatial professional, who inspired you to pursue a geographic education, etc. Remember, readers might not understand all the specialist terms we use, so try to keep your language accessible and briefly define the terms you use if it’s appropriate to do so. Depending on your employment, you might not be able to share certain details about your company or the projects you are working on. Please check with your managers or supervisors to see if this is the case. 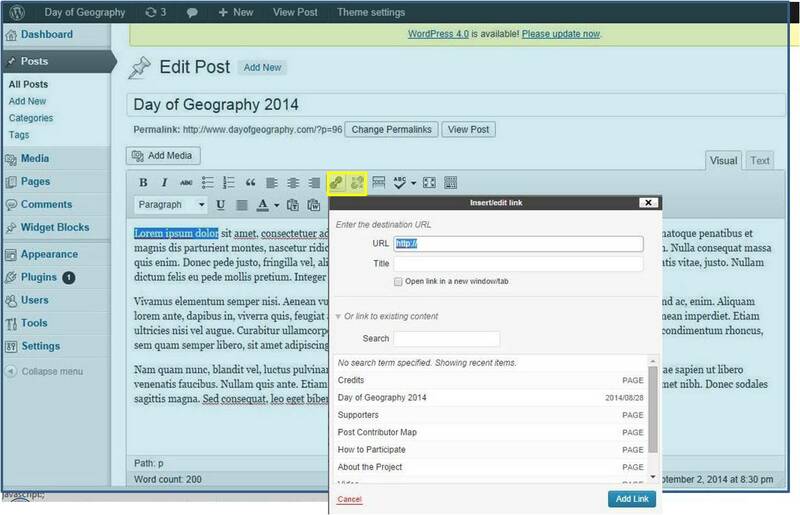 You can also contribute posts that do not mention specific locations, companies or individuals. Please do include where you are located in the world (City and Country). If your text is especially long, you might like to think about splitting your post so that the first couple of paragraphs appear on the page from the start, but visitors have to click a link to read to the end. This allows you to add more detail for those who are interested while keeping the basic post concise. To do this, decide where you want to split the post, make sure that the cursor is at that position in the text and then click the Split Post icon (hi-lighted yellow in image below). The blog will then automatically create a link for readers to see more after the point you have chosen. To add images to your post, click on the “Add Media” button (hi-lighted in image below). You will be taken to the Insert Media page. From here, click on “Upload Media”. From this screen you can either drag images from your desktop to upload or by pressing “Select Files” (hi-lighted yellow in image below), to navigate your computer to find the images. Once you have selected your photo click “Insert into Post” (hi-lighted blue box in image below). If you are linking an image from a website, click “Insert from URL” (hi-lighted green box in image below). Under the “Insert from URL” heading, enter or paste the URL of the image you wish to add. Below this area there is a space to add a title for the image. Including photographs and pictures with your entries is a great way of making them more attractive; however a number of points need to be considered with regard to copyright. An image will have a copyright holder, and so it is important to be sure that we have permission to use that image. There are three common types of image that are acceptable for use. 1. Images in the public domain these are images that are explicitly available for use free of copyright. A good example are images licensed under Creative Commons. A number of such images can be found using this search engine. 3. Other images used with clear permission. Generally, if you find an image in a web page, there will be a part of the site which details copyright ownership. It is extremely important to ensure that you have permission from the copyright holder before you use an image on your Day of Geography entry. Please be sure to include a copyright note at the end of the caption for each illustration used in an entry. Images which do not give clear indication of copyright ownership and permission will be removed. For more information on copyright and seeking permission please visit the Canadian Intellectual Property Office website. To insert a link into your post, select the text that you would like to link to another webpage. Click the link icon in the toolbar (that’s the one that looks like a chain – hi-lighted yellow in image below) and type or paste the URL. Don’t forget to enter a title too it will appear when the blog visitor hovers over the link. Day of Geography is moderated by volunteers. Submissions will not be accepted that are irrelevant, defamatory, obscene, abusive, threatening, or an invasion of privacy. Derogatory remarks or innuendo towards any individual or group, including those that may be construed as offensive by any individual of a certain race, gender, sexual orientation, or religion, are not acceptable. The decisions of the moderators are final.